When America entered the hostilities in April 1917, Evangeline Booth (USA National Commander) placed the entire Salvation Army in the USA on a war-service basis. Hostels and service centers were established adjacent to military camps and when the American Expeditionary Force went to France, Lt-Colonel William Barker was dispatched to see how the Army could best serve them. 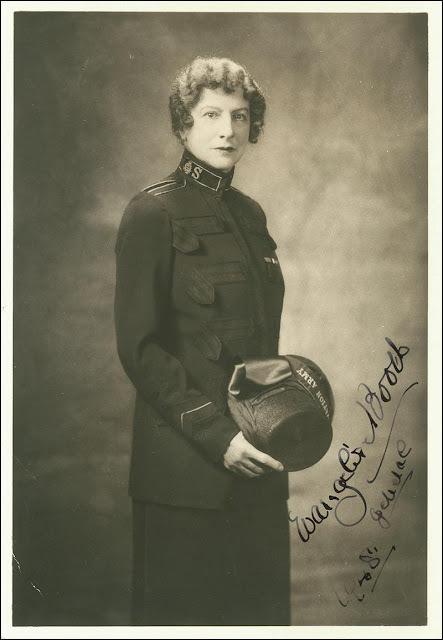 In response to Barker's request to "Send over some Lassies", Evangeline dispatched a group of eleven handpicked officers, including four single women believing that quality mattered more than quantity. 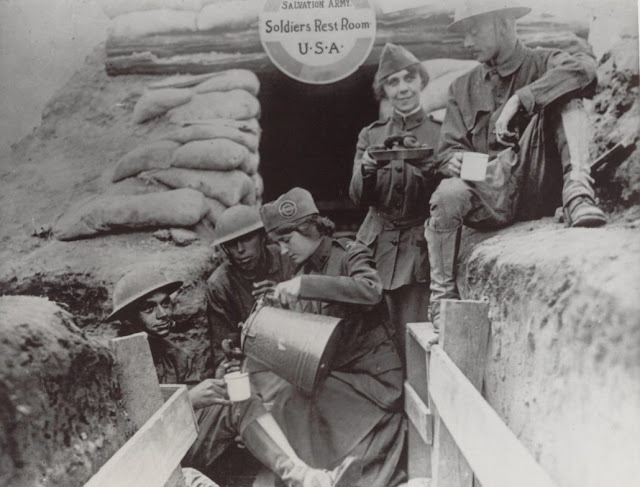 More officers followed and Salvation Army huts, rest-rooms and hostels soon sprang up wherever the American troops were stationed, some right at the front line where the women as well as men were in danger from shells and gas. In October 1917, Ensigns Helen Purviance and Margaret Sheldon, decided to lift the spirits of the troops by providing some real home cooking. 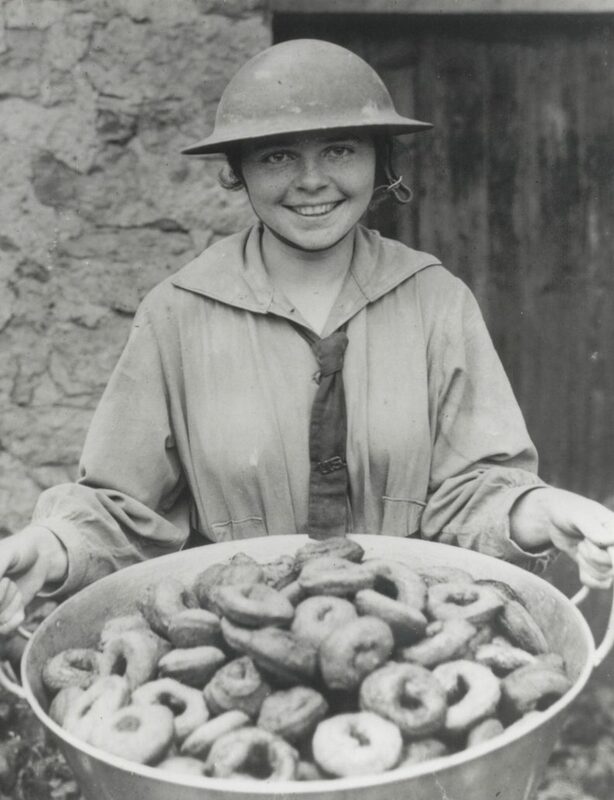 With only flour, sugar, lard, baking powder, cinnamon and canned milk at their disposal it was agreed that they would make and serve Doughnuts. The dough was patted into shape by hand and fried, seven at a time, in a small pan. The tempting fragrance of frying doughnuts drew the homesick soldiers to the hut and they lined up in the rain waiting for a taste. 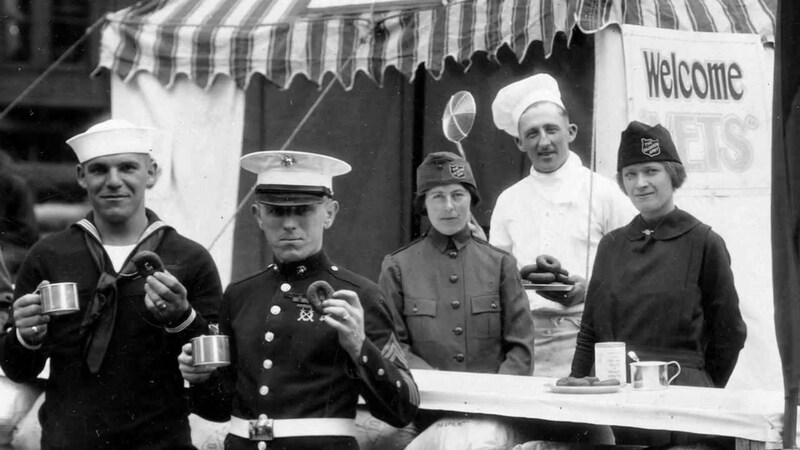 Although the Ensigns worked late into the night, only one hundred and fifty were served. 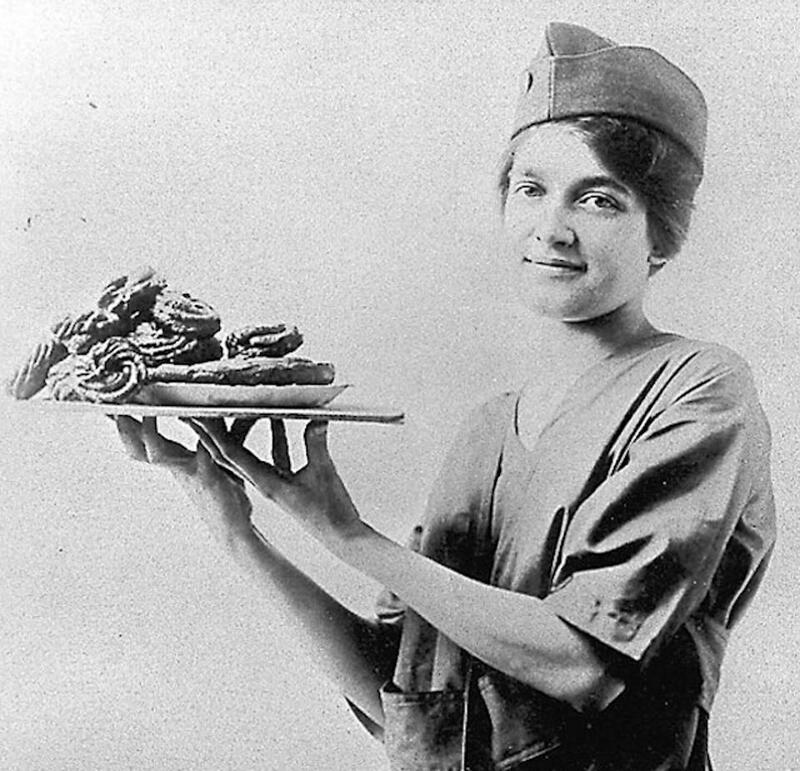 The next day the number was doubled and later, when fully equipped for the job they served up to nine thousand doughnuts daily. 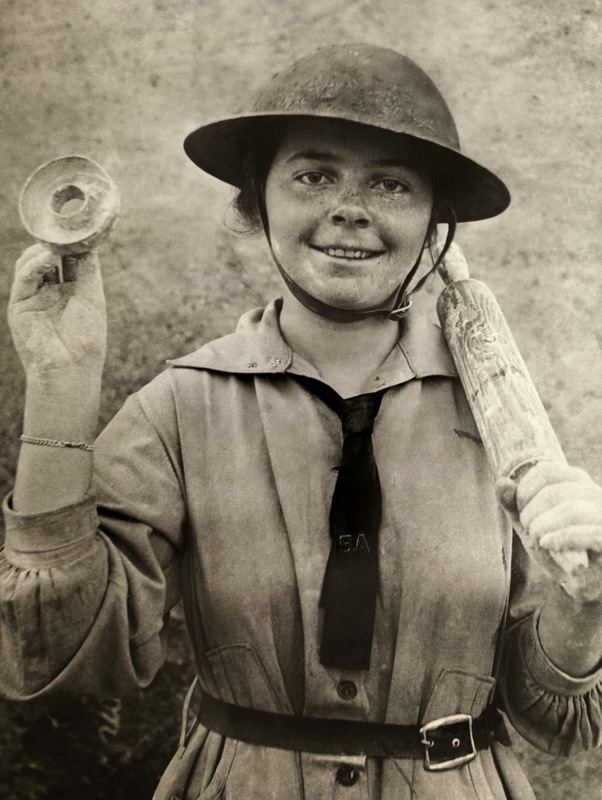 Stella Young, a "Doughnut girl" holding a rolling pin and donut mold. 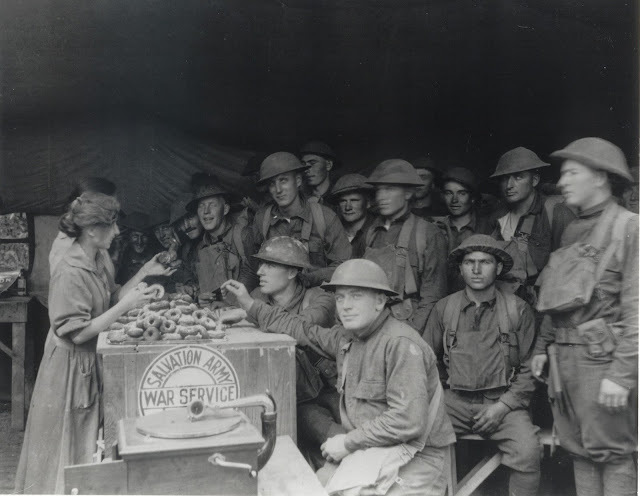 Stella Young holding pan of doughnuts. 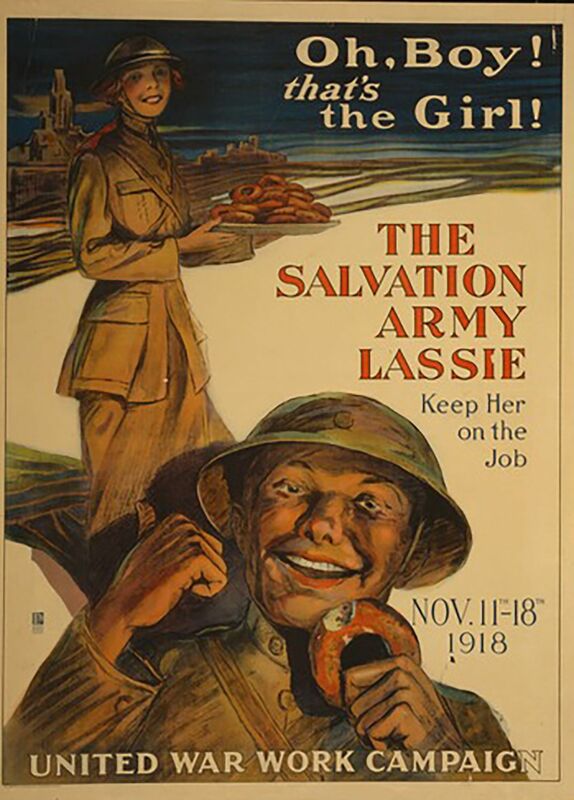 A Salvation Army poster for the campaign. The soldiers cheered the doughnuts and soon referred to the Salvation Army lassies as "Doughnut Girls" even when they baked apple pies or other treats. 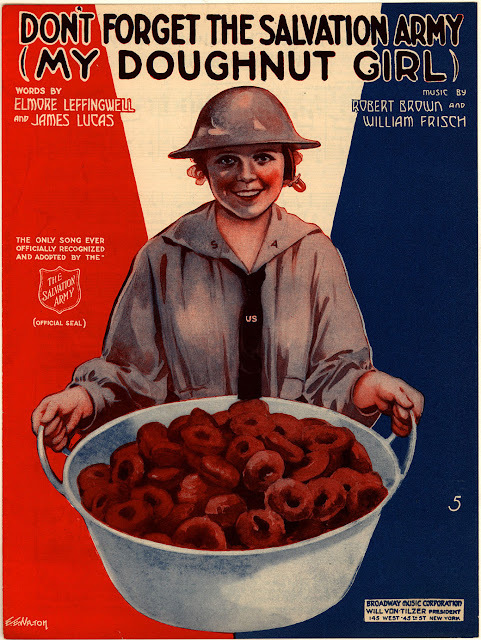 The simple doughnut became a symbol of all the Salvation Army was doing to ease the hardships of the frontline fighting men, the American Expeditionary Force was nicknamed "The Doughboys" and from being viewed with an attitude of scepticism the Salvation Army soon became the most popular organization among the troops in France. 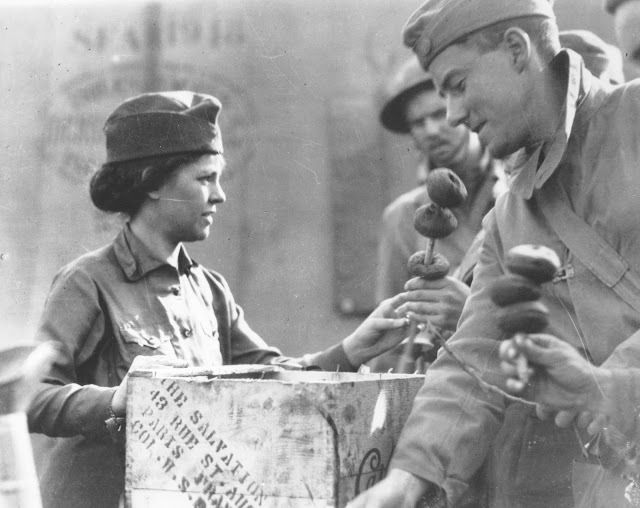 The work of the Salvation Army. 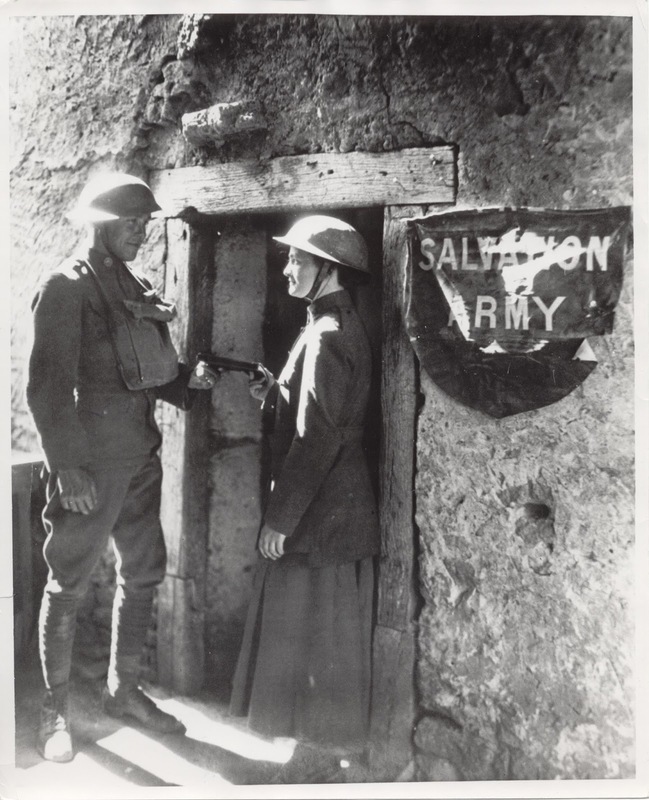 Salvation Army volunteers traveled overseas to set up service “huts” located in abandoned buildings near the front lines where they could serve baked goods, 1920. 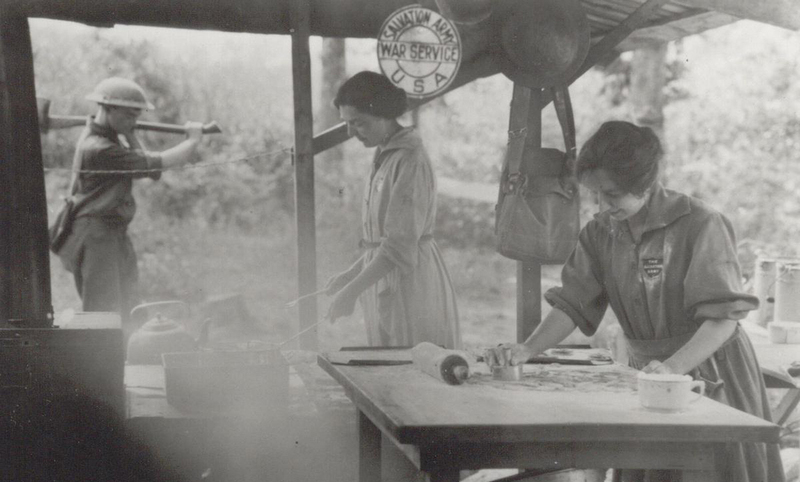 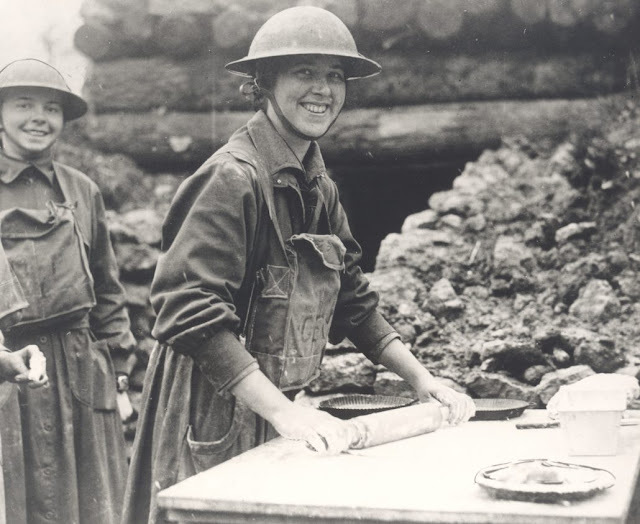 Women of the Salvation Army relied on ingenuity to serve up thousands of donuts to WWI soldiers. Donut Lassies serving troops in the trenches during WWI. 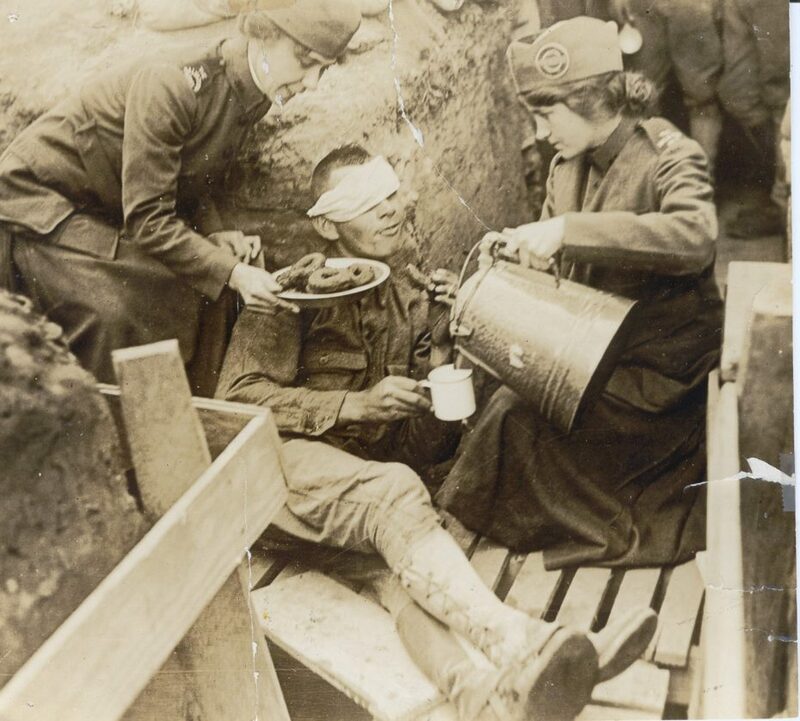 Donut Lassies serving a wounded soldier. 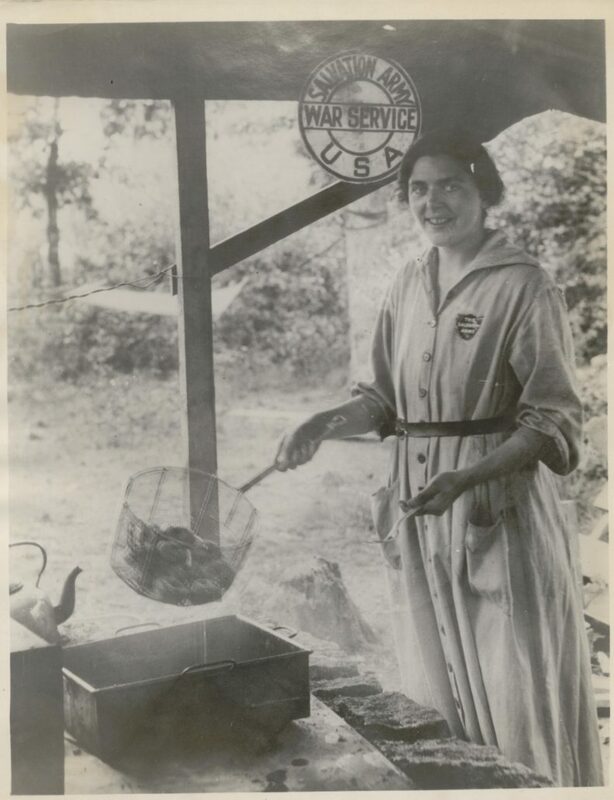 Helen Purviance serving in France.